This week has been filled with many subcommittee meetings. 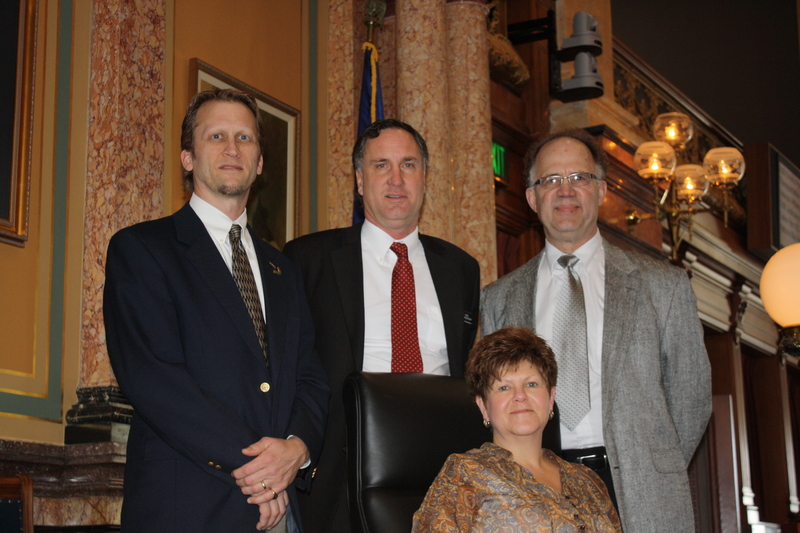 I also had the chance to meet with the Pork Producers and Iowa Soybean Association member Bob Ballou. Mayor Dena Himes, City Administrator Doug Herman, and Council Member Tom Yeoman visited the Capitol for the League of Cities Hill Day. This Saturday I will meet with the 9-12 group in Anamosa at 9:00 am. I will also be attending a forum on Saturday at the Dubuque County Farm Bureau in Dyersville at 10:00 am. Next Saturday, February 4th, a forum will be held at Selma’s Kitchen in Olin at 9:00 am. As always, the forums are open to the public and I welcome anyone to come and share any comments or questions you may have. Last year we passed a bill allocating $3 million for the restoration of the USS Iowa. Today we passed a bill providing direction on how the money should be spent. Being a citizen of the State of Iowa, you can visit the USS Iowa for free by showing an ID that proves your residence in Iowa. The USS Iowa is currently located in California. In a report issued this week, Department of Transportation Director Paul Trombino identified 13 efficiencies with total savings projected at $50 million. The money-saving efforts and subsequent report came at the request of Governor Branstad. He directed the department to find efficiencies in order to free up more money in the Road Use Tax Fund for the improvement of the public roadway system. According to the DOT, the fund has a $220 million critical needs shortfall. The report separates the efficiencies into two categories: Program Efficiencies and Partnership Efficiencies. Some of the program efficiencies include an assessment of rest area and weigh station investments ($1.5 million annually), a reduction in roadside vegetation improvements ($1 million annually), and the selling of unnecessary right of way parcels ($1 million in one-time). Another savings worth a one-time $11 million is the implementation of an asset management tool. This would help the DOT make better decisions on how and when to upgrade and maintain their physical assets. Similar, the department found $10 million in savings annually that envisions the implementation of new budgetary management policies focused on post-letting project costs. The goal would be to deliver projects ahead of schedule and under budget. The other category of savings is partnership efficiencies. The major savings found in this category comes from a surface transportation program ($5 million annually) and the integration of the motor vehicle enforcement division (commonly known as “blue coats”) into the Department of Public Safety ($5 million annually). This week the Iowa House passed the first bill of the 2012 Legislative session, House File 2042, a bill that requires all administrative rules created by state agencies must be accompanied by a ‘Jobs Impact Statement’. Administrative rules are the regulations drawn up by government bureaucrats to implement laws approved by the legislature. The bill codifies a requirement previously put in place by Governor Branstad via Executive Order 71. It requires that every proposed rule contain a jobs impact statement which sets out in detail the impact of the proposed rule on state agencies, local governments, the public and Iowa businesses. Additionally, it must determine whether a proposed rule would have a positive or negative impact on private sector jobs and employment. House Republicans are committed to creating policies that put Iowans back to work. During these difficult economic times, we must not let government rules create uncertainty for Iowa’s businesses. The best way to put Iowans back to work is to advance policies that create an environment that encourages employers to keep and create jobs right here in Iowa. The bill passed the House unanimously and is now sent to the Senate for their consideration. The House passed SF 2007 this week. It’s a supplemental appropriations bill providing an additional $1.3 million to the National Guard Educational Assistance Program (NGEAP, pronounced Nee’GAP) for FY12. This will be in addition to the $3.186 million appropriated last year, totaling $4.486 million. The reason for the sudden increase was an underestimation in the amount of soldiers who would apply for the funds. With Iowa’s largest deployment in the history of the National Guard ending recently and the ending of the war in Iraq, deployments are down and returning soldiers are up. 2010 and 2011 deployment numbers were around 3,000, while 2012’s numbers are less than 250. In the 2010/11 school year, there were just under 900 unduplicated students who were given awards, while that number is estimated now to be at 1,440 for 2011/12. The College Student Aid Commission (CSAC), which administers the program, expended $2,366,134 of the FY12 appropriation, leaving $820,099 for second semester. The men and women of the Iowa National Guard serve our state bravely and heroically. House Republicans are happy to have acted swiftly to fulfill our commitments to them. During the first two weeks of the session, the House Ways and Means Committee have held three subcommittee hearings on the House property tax proposal, and a separate subcommittee on the Governor’s proposal. The House Republicans and the Governor have made concessions that are reflected in both plans. The House listened to concerns from local governments and by using an exemption model, implemented over 14 years, gives businesses certainty, while allowing local governments the flexibility to plan ahead. Meanwhile, the Governor has extended his phase in from five years to eight. The Senate Democrats have dug in their heels and not moved off their proposal from last year. Provides commercial property tax relief to 100% of businesses – we need job creators of all sizes to invest and hire. Aligns local government expenditures with the rate of inflation – but allowing local governments to spend more by putting it to a vote of the people. Creates action. If we do nothing a huge residential tax increase is on the horizon.